Currently Melbourne-based, I have worked in the UK, Europe, the USA, Canada and various other parts of Australia. I have also worked with many different groups of people, both as colleagues and students, who hail from all parts of our great global village, so the odds are good you and I already have something in common. There is a lot of information in this profile, so it depends what you want to know. If you are looking for a supervisor, my academic and research interests are detailed in the 'Interests' and 'Research' sections, thus if you are considering academic supervision in those areas, or in anything that might be connected to those areas, I'd be delighted to speak with you. If you want to see the breadth of my teaching or supervisory experience, then please check out the 'General' section (the 'Teaching' section auto-populates from an internal system over which I have no control, and the information there is limited. Ah, technology). My publications are in the 'Publications' section and I have added some pretty cover-art in the 'Research' area to accompany the write-ups, but there's that technology thing again, so no promises. As for 'Links', well, not many yet; I'll update as inspiration appears. And if you have anything you'd like to discuss, even if you're not a student (or planning to be a student), then please feel free to email me. Always happy to chat about writing and research and literature and SF. Student Voice Educator of the Year Commendation 2014, 2015, 2016, 2017. Student Voice Distance Educator of the Year Commendation 2015, 2016, 2017. This foundation course introduces students to the context of university learning and will help them become effective lifelong learners. Different perspectives on learning at university are examined in the context of the University as an evolving Institution. By developing an understanding of the principles and techniques of effective learning at university, students can apply this to be successful self-regulated learners who manage the learning environment and learning tasks. This course will transition students between secondary and tertiary education and will help them become effective lifelong learners. Different perspectives on learning at university are examined in the context of the University as an evolving Institution. By developing an understanding of the principles and techniques of effective learning at university, students should be able to apply this to be successful as self-regulated learners who manage the learning environment and learning tasks. This course examines relationships between information technology, communications and contemporary commercial and political culture. By combining texts taken from several disciplines with close analysis of case studies, this course bolsters high level communication skills. This course provides principles and practices for connecting school with the global knowledge economy and shifting schooling from the ideas of the manufacturing economy to prepare students for knowledge work. Notions of sustainable enterprise are introduced along with pedagogical principles for creativity, innovation and entrepreneurship, underpinned by a solid body of disciplinary knowledge. This is a core course for the Master of Professional Education program. It explores concepts of education, both historic and contemporary that underpin educational ideals. The course is problem-solving based and aims to encourage students to explore the antecedent philosophies, practices and pedagogies of contemporary education. This course provides an understanding of the role of human resource development (HRD) function in an organisation, as well as providing the underlying concepts and principles upon which HRD is based. Graduates in human resource management are expected to fill a wide range of roles in organisations. Regardless of the position, some fundamental skills are required of graduates from the very start of their career. These include interviewing skills, training and facilitation skills, and basic conflict resolution and negotiation skills. This course is designed to provide students in the latter part of their degree to build upon theory from earlier courses, and to acquire skills that will be applicable in the workplace. the scope and features of the communication arts, to develop critical and creative thinking appropriate for the attainment of the Masters degree, and to apply that thinking to the resolution of complex problems concerning the role of communicating in a global context. course aims to provide a solid reference base for the Arts Administrator and to develop critical and creative thinking appropriate for the attainment of the Masters degree. This course explores principles and practices for managing classroom diversity. The course examines the enabling factors of talent, tolerance and technology in the knowledge economy and explores aspects of behaviour management in a range of students to manage the transformation to achieve this end. The course asks students to consider the meaning of success, the pride and conflict of diverse groups of students, gender equality, and citizenship education in the quest for individual empowerment, action and change to enable the self-discipline of the student. The course aims to develop critical and creative thinking appropriate for the attainment of the Masters degree, and to apply that thinking to the resolution of complex problems. This course evaluates the changing role of leadership in Mode-2 Society. The course involves analysis and evaluation of post-modernity with orientation to the Creative Arts. Commencing with analysis of theories of social organisation, the course proceeds to examine styles of leadership in the context of the socially robust Creative Arts. This course requires students to demonstrate research skills, analytical skills, and writing skills, as well as critical thinking, creative thinking, synthesis and contextualisation. The course critically examines how to determine the research question, what constitutes a literature review, research methods, and discussing research outcomes, report writing style, correct referencing and report compilation. The student is required to select a research topic relevant to the Professional Educator and compile an original research report. Above all, the research report must demonstrate critical thinking, research analysis, and draw a conclusion relevant to the research question. This course focuses on the role of advertising and design as communication arts with specific reference to the mass media and its impact fine arts, museums and galleries, broadcasting, film, television, fashion design, graphic design, web design, theatre, music, publishing, computer/video games and the production of events. Students will undertake an evaluation of the impact of advertising brand and design in arts communication to acquire the analytical skills for effectively designing promotions for the creative arts. This course requires students to demonstrate research skills, analytical skills, and writing skills, as well as critical thinking, creative thinking, synthesis and contextualisation. The course critically examines how to determine the research question, what constitutes a literature review, research methods, and discussing research outcomes, report writing style, correct referencing and report compilation. The student is required to select a research topic relevant to the Creative Industries including film and television, design, new media, and/or performance/events and compile an original research report. This course focuses on the composition and scope of the Creative Industries including fine arts, museums and galleries, broadcasting, film, television, fashion design, graphic design, web design, theatre, music, publishing, and the production of events. Features of the Creative Industries are analysed with reference to new knowledge production, creativity, innovation, massification, globalisation, and the global reach of the Creative Arts. Intercultural Communications: Why Are There Misunderstandings? How have digital innovations affected the photographic industry? Is there a connection between violence in videogames and violence in children? Should Art be subject to moral judgment? Is the Chinese government loosening its hold of Chinese media? Music piracy: Is it wrong? Our online existence: Is virtual winning? How are societies coping with gaming addiction? Should advertising directed at children be more closely regulated? New Words: Blogs, Vodcasts and Twitter – what happens next? Do animated films comment on contentious social issues? How is SPAM affecting the genuine advertising industry? Why are BMW and Mercedes Benz such popular brands of car in Thailand? Where Will Mobile Phone Technology Take Us? Why Do University Students Drink Alcohol? An Exploration of University Students Sexual Morality in Melbourne, 2005. What is behind the Obesity of Melbourne children? Why Do University Students Want to Study Overseas? What are the Benefits of Chinese – American Collaborative Film Projects? Why Does Tourism Endanger National Culture? What are the advantages of living a Western lifestyle? You are what you eat: What are the health effects of dieting in females aged 18-30? Why is Green Tea Gaining Popularity in Melbourne? Which way is technology going? An analysis of MIC-Students’ Technology Preferences. Why is the Spa Industry So Popular? Currently supervising one PhD and one Masters candidate. "When All Wars are Done: The Transcendent Humanity of Iain M. Banks"
This chapter examines the work of Iain M. Banks. It discusses how Banks re-images his future villains into the ‘Us’ and ‘Them’ (the ‘Other’) of Edward Said's mystical and allusive Orient. Often using a physical response to deal with enemies that are ideologically perilous, Banks' Others threaten not only the physical, but more importantly, the philosophical. His Culture-citizens will not be beaten despite apparently overwhelming odds and unspeakable force. Banks wants the ideology of his protagonists to survive intact rather than simply witness an obliteration of the enemy. The analysis includes works such as Consider Phlebas (1987), The Player of Games (1988), Use of Weapons (1990) and Excession (1996). This book is about the human desire to experiment with empire. In the past it was done with real soldiers and expeditions and slaves and trade and misery and force. In the future it will be done with generation ships and off-world pioneers, robots and invasion, electronic sheep and people who just don’t want to be pushed around any more. Beginning with a discussion of who ‘we’ are (hopefully, the good guys) and who ‘they’ are (anyone who isn’t us), this narrative scans the lights of science fiction looking at the places where humans try to touch a variety of futures. Is SF designed to purge our dark imperialistic fantasies, or is it a laboratory of mind-experiments: carefully considered trials of political, social and economic scenarios? Which tomorrow are we more likely to accept – where the blood of empire is red or read ? Examining such classic SF texts as Lasswitz’s Two Planets and Wells’ The War of the Worlds, this book investigates Asimov’s Robots and Heinlein’s Moon, as well as Robinson’s Mars and Banks’ postcolonial Culture. We see the rise-and-fall of empire through the eyes of Miller, Clarke and Wyndham, and the apparently inevitable failure of the imperial project as discussed in Solaris, The Dispossessed and The Forever War. This book offers an insight into the darkest power abuses of mankind; where the oppression, silencing and marginalisation of those who are not-us continues and flourishes. Who are the monsters of our future – the Others invading from another planet, or the unseen and unrecognised Other within? "This fascinating and well-written encyclopedia consists of two parts. The first part (volumes 1 and 2) takes 400 of the most popular themes found in both science fiction and fantasy literature, and puts them into historical and cultural context. The second (volume 3) contains entries for a selected list of classic novels, films, and television series; these include entries for all the different Star Trek series, Dr. Who, Farscape, Buffy the Vampire Slayer, The Twilight Zone, and The X-Files. The overall value and usefulness of this set is greatly increased by the treatment, within many of the individual entries, of how an individual theme developed over time in a variety of different science fiction and fantasy formats (short stories, novels, films, television series, comics, computer games, etc. ), and in material that is outside the mainstream of science fiction and fantasy (fairy tales, folk tales, historical events, operas, classic literary works, etc.). A detailed index and extensive cross-references make this set equally useful for novice readers looking for more material on a particular theme and for professional writers. Recommended. All levels." "The pithy and informative entries cover a lot of ground for both film and print formats in about two pages. Each one includes an overview paragraph; a survey of the theme with references to books, films, and possibly television shows; a brief discussion of the topic or classic under consideration; and a bibliography….With its excellent organization and cross-referencing, concise entries, and detailed index, The Greenwood Encyclopedia will be of interest to fans or students of these genres." "This is the wonderful sort of book that one keeps by the bedside, or one's reading chair, dipping into it to read an entry or two (and it's surprising how the hours can slip by as you follow the thread of one entry to another and another…). [i]t's also the sort of book that belongs in the homes of serious readers and writers of the genre, rather than being something you have to make a trip to the library to peruse. But investigate it you should, for it holds a wonderful wealth of information…. [t]his is truly an indispensable reference tool." Works of science fiction and fantasy are enormously popular among students and general readers. The combined effort of some 150 expert contributors—including Richard Bleiler, John Clute, Ian Nichols, and Darrell Schweitzer—this encyclopedia discusses pervasive themes in science fiction and fantasy and gives detailed attention to selected novels, films, and television series. The first two volumes provide 400 alphabetically arranged entries on individual themes, while the last volume includes alphabetically arranged entries on 200 particular works. Accessible to a wide range of audiences, this encyclopedia is destined to be a favorite resource for anyone interested in fantasy and science fiction. While other references provide relatively brief entries, or offer essays on a limited group of writers, this encyclopedia gives extensive treatment to the most important themes and works of science fiction and fantasy across a range of media. Essays: "Moments of Empire: Perceptions of Kurd Lasswitz and H.G. Wells"
The Times Literary Supplement:"Cherry-picked from the Wellsian"Professor W. Warren Wagar, Emeritus Professor of History, State University New York: "I bought a copy of the anthology of articles from The Wellsian directly from Equilibris and was much impressed not only by the contents but also by the sheer handsomeness of the volume. Equilibris is clearly a serious professional house."Dr. J.R. Hammond, President of The H.G. Wells Society: "I am really impressed with the book. It is most attractively printed and produced, and is a credit to all concerned. "Professor Patrick Parrinder: "The Wellsian book is splendid - very well edited and produced - congratulations!" 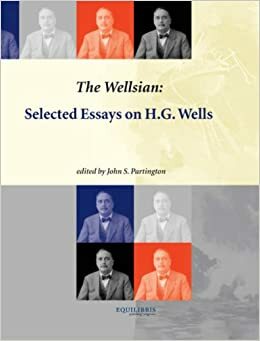 In 'The Wellsian: Selected Essays on H.G. Wells', John S. Partington brings together a selection of the finest articles published in The Wellsian, the journal of the H.G. Wells Society, from 1981 to the present. The volume covers a wide breadth of Wells's work and thought, with essays from Lyman Tower Sargent on utopianism, Patrick Parrinder on The Time Machine, David Lake's textual analysis of the scientific romances, Michael Sherborne on Wells and Plato, and many others. With The Time Machine, The Island of Doctor Moreau, The War of the Worlds, The Sea Lady, The Food of the Gods and The Door in the Wall all receiving detailed attention, this volume promises to be a worthy memorial to the first twenty-five years of The Wellsian. As well as celebrating Wells's greatest literary achievements, it explores the philosophical basis of his thought and, through several comparative studies, takes an interdisciplinary approach to his aesthetic concerns. "The Role and Practive of Science Fiction in Empire: Experiments in Imagination"
"The Duality of Kipling: An Analysis of Selected Works." Questioning that the human desire for leadership has changed at all over the millennia, or that Homo sapiens have/will ever achieve a status of individual enlightenment. Using the analogies and metaphors of SF, examples of the desire/requirement for leaders and leadership in multiple environments and conditions are interrogated. Explores the nature and role of the hero, past and contemporary; differences between generational and cultural hero; what activities are deemed heroic in C21st? Heroic icons; historical, sporting, cultural, physical, symbolic, metaphorical and metaphysical. National, international, transnational heroes. The evolution of the hero; portrayal of the hero in media and film. The politics of heroism; gendering; heroism of the patriarchy. I am fascinated by Literary and comparative Science fiction, Imperial politics and Postcolonial theory.In addition to my teaching responsibilities, I also assess postgraduate theses, both major and minor, and provide reviews of all manner of technical and creative writing works.I was the first woman in Australia to gain a PhD that discussed the theoretical and cultural politics of empire in SF, and am continuing my research in this area, investigating various tropes and perceptions of the genre throughout its history. Kerslake, P. (2015). Globalization, utopia, and postcolonial science fiction: new maps of hope. Utopian Studies, 26(2), 409-412. Kerslake, P. (2011). Making a case for equity initiatives : Travelling towards a mirage? gender, leadership and higher education by Tanya Fitzgerald & Jane Wilkinson [book review]. Australian universities' review., 53(2), 129-130. Retrieved from http://issuu.com/nteu/docs/aur_53-02. Kerslake, P. (2002). Moments of empire : perceptions of Kurt Lasswitz and H.G. Wells. Wellsian., 25, 25-38. Kerslake, P. (2012). When all wars are done : the transcendent humanity of Iain M. Banks. In Unknown (Ed. ), Future wars : the anticipations and the fears edited by David Seed. (pp. 201-217). Liverpool, UK: Liverpool University Press. Kerslake, P. (2003). Moments of empire : perceptions of Kurt Lasswitz and H.G. Wells. In J. S. Partington (Ed. ), Wellsian : selected essays on H.G. Wells (pp. 69-83). Oss, Netherlands: Equilibris.